(5:36 p.m. EDT) -- One year into Royal Caribbean's $900 million revitalization program, and the line has already introduced a slew of firsts, including new restaurants and bars such as the Bamboo Room, Lime & Coconut, and an "amplified" version of Johnny Rockets that serves up alcoholic milkshakes. In an exclusive interview with Cruise Critic, Royal Caribbean's global vice president of food and beverage, Linken D'Souza, shared details about what's cooking in terms of changes to the line's dining program. 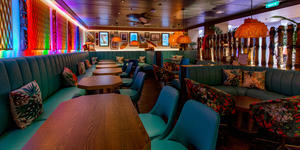 He also hinted we can expect to see this trend of new dining concepts continue on Oasis of the Seas, the next ship scheduled to enter dry dock as part of the line's $900 million investment, which aims to inject new life into the line's Voyager- and Freedom-class ships, as well as Oasis and Allure of the Seas. "Vacations are about trying something new and being adventurous. I think our guests are adventurous, and I think it's great to be able to create those experiences," D'Souza said, highlighting the Bamboo Room (which debuted on Mariner of the Seas and is now on Navigator of the Seas) and Lime & Coconut bar, which was recently unveiled on Navigator of the Seas. "Those bars were designed for the short Caribbean [cruise] market. We know for that market cool bars are important. If you're on a weekend trip, you know you're going to hang out; you know you're going to have a little bit more to drink than you would on a regular cruise." But Royal Caribbean's dining investments aren't confined to new venues. D'Souza said the line continues to build on its restaurants, using passenger feedback as a guide. An example is the new grab-and-go-style Johnny Rockets Express on Navigator of the Seas. "Johnny Rockets on Navigator is revitalized, and people may not notice the differences, but there are differences. One, it's an express menu on the pool deck. In addition ... we have adult milkshakes." The Playmakers Sports Bar & Arcade on Navigator of the Seas also has more seating and TVs than the space on Mariner of the Seas -- an addition that was made after Royal Caribbean's concept team saw room for improvement in the traffic flow in front of the bar. 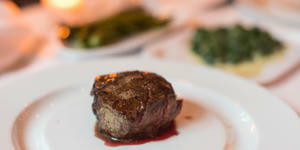 In other venues on select ships, new menus and dishes are offered on a trial basis. D'Souza also said the line has taken drastic steps toward ensuring consistent quality and operations across the fleet, particularly with its main dining room and Windjammer buffet, and staples such as Chops Grille steakhouse. "We've really fine-tuned our [fleetwide dining], and I think part of that process has helped us create consistency," D'Souza said. "If I go to Chops and have a steak, whether it's in Florida or in Shanghai on Quantum of the Seas, the steak should be the same. It should be seasoned the same way, it should be prepared the same way ... if it isn't, you've created an expectation that you can't deliver on now." Guest feedback also goes beyond improvements, D'Souza said. He recalls an email he received from a returning passenger inquiring about a retired dish. "This guest sent me an email saying, 'I had this dessert 20 years ago on the ship and you guys don't make it anymore, but hey, I have a copy of the recipe that they gave me.' I'm like, OK send me the copy, and then the next week she sailed, we had the dessert for her. "We go out of the way onboard our ships to deliver a special experience for an individual guest because we're here to create great vacations. And food, to me, is a big part of a great vacation. Not everyone is going to have a special request, but when they do come in, we take those really seriously." As for what's in store for Oasis of the Seas, D'Souza wouldn't spill any details on the new dining concepts that will debut after the ship's September 2019 refurb. The line, however, has said it intends to make the same "splash" in the industry as it did when the ship launched in 2009.